Virgil van Dijk has produced more moments of magic this season in the Reds’ defence than it’s possible to count, but Reds fans might have missed the beauty he came up with against Crystal Palace. 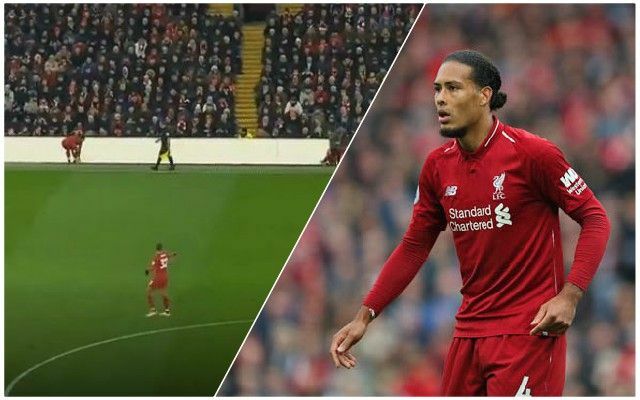 As the ball went out of play in the second period of the game in the left-back area, he took a quick throw-in with Andy Robertson upfield and channelled his inner Roberto Firmino as he did so. You can watch the clip of his creative throw-in by clicking here. A no-look throw-in is certainly a new one – but the Dutchman pulled it off like he’d done so several times before! Perhaps throw-in coach Thomas Gronnemark had something to do with it. The main thing was that the Reds got the three points this afternoon in a topsy-turvy game that lacked the level of control Jurgen Klopp has seen his team exert in most matches this season. Nevertheless, the seven-point gap to Manchester City is restored again, at least until tomorrow. It’s good to see Van Dijk was confident enough to provide us with some additional entertainment en route to the victory, as well.